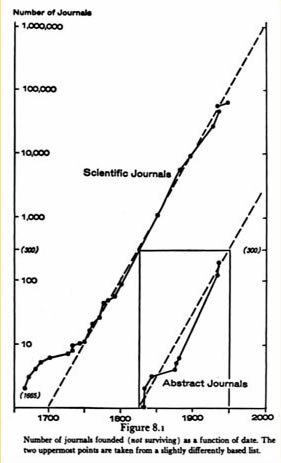 This chart (1975) antedates the contemporary world of web-based scientific publishing. This new world has many facets: traditional print formats of journals; electronic journals accessible only after paying a subscription cost; "open access" publishing in which authors, or some sponsoring body, pays for articles to be freely available; journals in which some content is freely accessible and other content not; and repositories in which authors of journal articles benefit from digital rights conferred by publishers to mount some version of their articles in "institutional repositories". Screen shots displayed here depict the Directory of Open Access Journals; a publisher plan whereby authors can opt to make their articles open access; and one of the leading open access repositories. There has been a huge amount of discussion in the past decade about alternative publishing models. Yet, the traditional format of the journal still endures. This is so despite the widespread access to information enabled by the web as well as questions raised about the inherited concepts of intellectual property rights and peer review. Concerning peer review, one author mentions that "The Royal Society of London is frequently assigned the credit for having introduced the concept of refereeing or reviewing scientific manuscripts for publication. In 1752, the Society, after almost 100 years of existence, took over the fiscal responsibility for the Philosophical Transactions. The society established what they called a 'Committee on Papers,' whose function it was to review all articles that were published in the Transactions." The author mentions that we can find historical antecedents or cases of the practice of peer review. Whether the spiraling costs of journals will challenge the traditional journal format or whether new, more affordable publishing formats emerge is anyone's guess. Derek de Solla Price. Science Since Babylon. Enlarged Edition. New Haven: Yale University Press, 1975, page 167. David A. Kronick, "Peer Review in 18th-Century Scientific Journalism", JAMA, March 9, 1990 Vol. 263, no. 10, 1321.